This case was filed on January 15, 2016. It involves a precarious injury for the elderly: a broken hip. The resident was a fall risk but had not been assessed because she had only been there for hours. This is a nursing home fall case. A woman, a resident of Somerset County, Maryland, is admitted to Manokin Manor, a Somerset County (Princess Anne) nursing home, for rehabilitation after suffering a stroke and extreme delirium. The woman is dependent for many activities of daily living. She has trouble walking and frequently experiences confusion. Because of these conditions, the woman is at a high risk for falling. A few hours into the woman's admission, she needs to use the restroom. She uses the call bell in her room to have a staff member assist her with moving to the bathroom. When no one responds, she is forced to make her way to the bathroom independently. In the process, she slips and falls, fracturing her left hip. After her fall the woman is transferred to Peninsula Regional Medical Center to undergo surgery. The surgery is not successful in restoring complete strength and mobility to the woman's hip. She continues to experience severe pain in her left hip today. The personal representative of the woman's estate filed a medical negligence lawsuit in Somerset County, alleging that the Defendants breached the standard of care by failing to (1) maintain safe and adequate facilities and equipment, (2) retain an adequate staff to attend to the woman's care and needs, and (3) formulate, adopt, and enforce adequate rules and policies to ensure quality care. Failed to formulate, adopt, and enforce adequate rules and policies to ensure quality care for the patients. Terrance L. Baker, M.D., M.S. - Baltimore, Maryland-based licensed physician board certified in Geriatrics, Family Practice, Emergency Medicine, and Forensic Medicine. The lawsuit is extremely confusing. The alleged victim has apparently died but no mention of this is made in the Complaint. In fact, the Complaint asserts that she "is" a Maryland resident. The unique thing about this fall case is that that it happened so quickly. The resident had only been at the nursing home for a matter of hours. Had they done a fall assessment risk on the patient? Plaintiff is going to say they did not exercise skill and caution when assessing a new patient and planning the inpatient care. This would include a timely and a complete assessment of the patient's precautionary measures, and before they were able to do so, assuming she is a fall risk. This would also give her a call bell (they did that) and timely assistance with ambulation. There is going to be a contributory negligence issue in this case. The resident chose to get up and walk when someone did not come immediately (how long that was might be important, too). The woman has passed so she cannot defend her actions. But the question is - if she knew she could not walk safely on her own, why didn't she wait? Plaintiff will argue delirium, but she did apparently have the presence of mind to ask for help and then not wait for that help. We also do not know from the nursing home lawsuit how long the woman lived. That is going to be the big issue for valuing the pain and suffering damages in the case. If you have been badly hurt or if you have lost someone you love as the result of a negligent nursing home or assisted living facility, our nursing home lawyers can help you get the justice you deserve. Our law firm, Miller & Zois, has experience coupled with a history of success in getting large verdicts and settlements to help you get the best possible outcome. Speak to a malpractice attorney today at 800-553-8082 or get a free, no obligation online case review. We will review your options and help you chart the best course to getting compensation for the harm that has been done. What is the settlement value of a nursing home case? 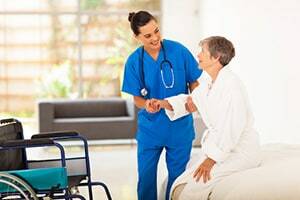 What is the settlement value of nursing home fall cases? What is the settlement value of a nursing home wrongful death case?